Societe General in France Experience Technical Problems. CarlosMurphy	banks, France	bank, france, glitch, holiday, it, natwest, problem, rbs, run, societe generale, technical, ulsterbank	Comments Off on Societe General in France Experience Technical Problems. 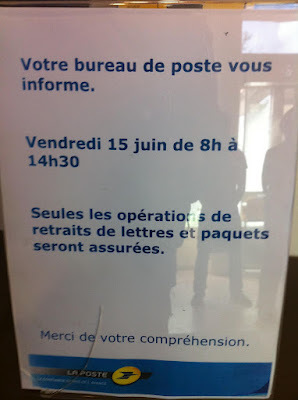 On June 18th , Banque Postal in France closed its doors due to a technical problem now we hear after the problems in the UK and Ireland with RBS. Nat West and UlsterBank, that Societe Generale has announced today 28th June that it too is experiencing technical problems. More and more signs that the banking system is extremely stressed. CarlosMurphy	banks, France	bank, banque postal, collapse, economic, euro, france, holiday, market, max keiser, run	Comments Off on Bank Holidays In France? Previously I spoke of bank restrictions in Italy in accessing your cash, now in France a similar story is now appearing. As reported by Max Keiser.com(from a reader) , that Banque Postal has stopped bank wires and cash transactions on Friday. It is interesting to see if this continues this week or will we be seeing more excuses here on in from banks for stopping customers from accessing their accounts. of the most important banks of the country. John Maudlin writes on the BusinessInsider of his prediction finally coming true. Germany notoriously deadpan against printing money due to its experience of Weimar hyperinflation had no solutions left to turn to, other than turning on the printing press. After all the LTROs worked for a short period but weren’t enough. Bild and Spiegel Online ran with stories of inflation stoking up deep-seated fears and memories from days gone by. The Bundesbank came out with a statement to try to prepare the German people. Maudlin continues with the state of the Spanish banks which are much worse than many realize. The write downs are not enough and the eventual recapitalization will need to be extremely large. Maudlin breaks down the debt and commitments that the Spanish government has, which breaks down similar to what ZeroHedge reported. As near as I can tell, Spain is guaranteeing about $20 billion of the new IMF funds that will be used for a European bailout. Spain already has $332 billion of liabilities to the ECB, $125 billion to the stabilization fund, another $99 billion for something called the Macro Financial Asset Fund, and various guarantees for other bank and European funds, all of which totals over $600 billion, give or take. Their public debt-to-GDP ratio is only 69%, but add in these other guarantees and commitments and you get over 130% debt-to-GDP. And that is before they start bailing out their banks, and before any additional debt from their fiscal deficit, which is running at 8%. (Yes, I know they say it will be around 5%; but they are in a deepening recession; unemployment is rising at an alarmingly high rate, which lowers revenues and increases government spending; and their bond costs are rising). So what state is France in? The banks of France are over 4 times the size of French GDP. The markets have been punishing the larger banks, with some of them down almost 90%. That would be a real crisis for the eurozone. German voters might not be willing to shoulder the European burden without a full partner in France. And there you have it, the reasons for the German u-turn. They will do whatever it takes to keep the European Union and eurozone together. And whatever it takes is a very open-ended plan. But it is going to cost them trillions of euros. On the eve of the French Presidential campaign, there is more news about the donation Gaddafi gave Sarkozy of €50million towards his presidential campaign in 2007. If true, it shows how ruthless Sarkozy was in return when you think of how he backed the war removal of Gaddafi. Fresh evidence further proves allegations about ties between Libya’s slain dictator Muammar Gaddafi and incumbent French President Nicolas Sarkozy, Press TV reports. A lawyer for Libya’s former Prime Minister Baghdadi Ali al-Mahmudi confirmed on Thursday that Gaddafi contributed over 50 million euros to Sarkozy’s 2007 election campaign. Mahmudi is now reportedly in detention in Tunisia. Earlier, the leftist French journal Mediapart published documentary evidence about the controversial funding source. The report said of an agreement signed after an October 6, 2006 meeting attended by Gaddafi’s spy chief Abdullah Senussi, the head his African investment fund Bashir Saleh, close Sarkozy associate Brice Hortefeux and arms dealer Ziad Takieddine. It claimed the 2006 document — allegedly signed by Gaddafi’s former intelligence chief and later foreign minister Moussa Koussa — were obtained “from the archives of the secret service” through former senior Libyan officials currently in hiding. Sarkozy refuted the document as “crude forgery” and has lodged a lawsuit against the whistleblower website. The allegations can seriously dash re-election hopes for Sarkozy, who lost the first round of presidential election to his Socialist rival Francois Hollande, given the French electoral rules that strictly ban politicians from receiving campaign contributions from foreign states. The latest revelation by the Gaddafi ally comes as debates between Sarkozy and heat up ahead of the May 6 presidential runoff. The Socialist hopeful has already called for an inquiry into suspected ties between Sarkozy and the former Libyan ruler.